This Backpack is used to make your Cryo CO2 Cannon Special Effects Tank mobile by carrying a 10 or 20 Lb Aluminum Cylinder CO2 Tank securely on your back. Padded Adjustable Shoulder Straps on this Tank Backpack make it more comfortable than others, as well as a bit more versatile for the different sizes needed for the person carrying it. By flipping the standard 20Lb tank (approx. the size of a dive tank) upside down, the liquid CO2 will flow from the nozzle down into your Hose. This will mimic the special effects associated with a larger 50 or 80 Lb. CO2 siphon tank while having the durability, and easy accessibility of a smaller and much more light weight tank. 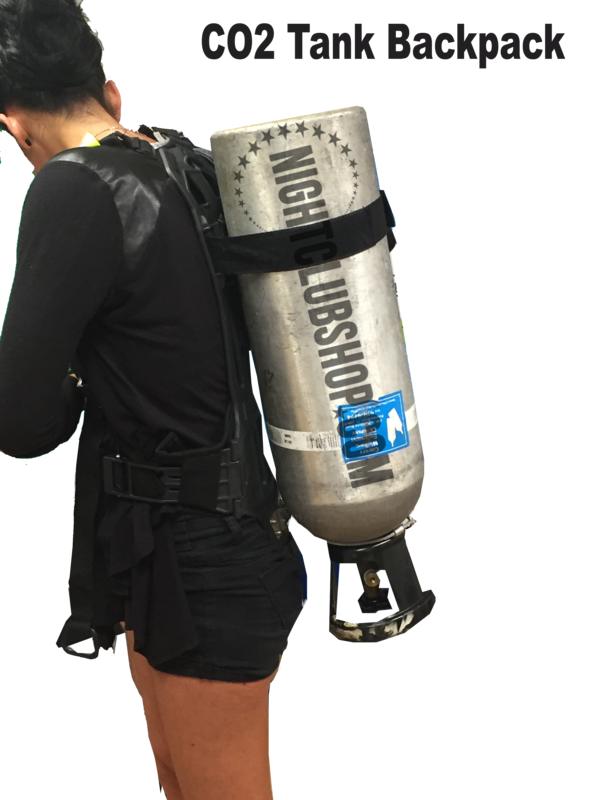 Adjustable and padded shoulder and waist Backpack straps on your back comfortable, and secures the Cryo Aluminum Cylinder CO2 Tank so that you can go mobile with your CO2 Cannon or CO2 Gun Special Effect. Fits 10, 15, or 20 Lb Pound CO2 Tanks.